Jul.09.2012Back in Time…I Drive the Chi-Town Hustler. Frank Hawley. Back in time… I drive the Chi-Town Hustler. Frank Hawley. So it’s around New Years and I get a call from my long time friend Lex Dudas, whose lengthy career in motorsports has taken him from NHRA Division Director to track management positions. Lex runs one of the most popular tracks in the country—Maple Grove Raceway—just outside of Reading, PA and home to the NHRA Auto Plus Nationals. I didn’t know at the time, but Maple Grove would be celebrating its 50th year anniversary in 2012. They were putting on a show and I was being invited! The race would feature jet funny cars, jet dragsters, Motz’s jet truck, wheelstanders, a bracket race, and my big interest: Nostalgia Nitro Funny Cars. Since I had a great win record at Maple Grove from the 1970s through 2008 in a Nitro FC, I was being asked back to drive. 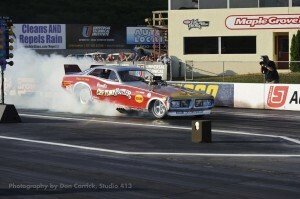 The fact that I didn’t have a Nostalgia Nitro Funny Car was not going to be a problem, as Lex had already made arrangements with the Nitro driver and team owner of the 1973 Chi Town Hustler, Troy Martin. Troy and I had met a year earlier when he kindly stepped down for the evening and let me climb back behind the Chi Town controls for a race at Summit Motorsports Park in Norwalk, OH. That evening had produced the best time the Chi Town car had ever run, so I was looking forward to another fast night. I accepted the offer, booked a flight and then had to wait several months for the big race. As the event drew near, I was also excited to hear that I was being inducted into the Maple Grove “Walk of Fame” alongside drag racing superstars Raymond Beadle, Dale Pulde and Don Prudhomme (who would also serve as the Grand Marshall of the event). This was an honor I’d not expected. I’m the type of person who gets easily bored in hotel rooms, so despite having arrived at the hotel in Reading at 3 o’clock in the morning due to bad storms in Philadelphia, I got up early and headed to the track. After stopping by to say hello to Troy and the crew, I started to roam the pits looking for folks I’d not seen in a while. When you’ve all but lived at the race track your entire life, you make a lot of friends. Even if you haven’t seen the people in years (or decades), you can still strike up a comfortable conversation as though you’d had another talk just last week. Of course I spoke with the aforementioned Prudhomme, Pulde and Beadle, but I also ran into Dale Emory, Dee Gant, Paul Smith, Peter Gallen, Mike Lewis, Steve Nichols and others. We talked about old times, our families, business, politics (we always talk politics) and other stuff. We were just a bunch of old racers enjoying some time at the track and with each other. The afternoon was hot, but I actually didn’t mind it that much. I suspect since I have lived in Florida for close to 30 years, it appears that some people—certainly me—can kind of get used to the heat. But the heat would affect the performance of the cars, so Troy and the crew were making some adjustments to the Hustler to prepare it for those conditions. They added a little more timing, made an idle adjustment during the warm-up, and a decision was made to “not make a decision” on the nitro until closer to run time. Meanwhile, the fans were stopping by for autographs, pictures and conversation. When I get a chance to do these events, I’m always impressed and humbled when fans pull out an old photograph they had taken of one of my old race cars from the 1970’s. These are original photos that these people have saved for decades, and they dug them out and brought them along for me to sign. This is always a very cool thing to do. I just don’t like the part when they tell me they were 5 years old when they took the picture. Just before the parade of featured cars, the “Walk of Fame” inductees were summoned to a stage they had erected in front of the grand stands. 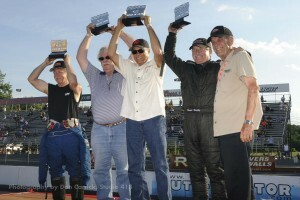 Prudhomme, Beadle, Pulde and I were interviewed by Bob Frey and presented commemorative plaques made by my friend Scott Weney at S&W Race cars. The format for the race tonight would be “Chicago Style,” where everyone makes two laps, with the quickest two from the first round running against one another in the second round to determine an overall winner. My first round opponent was Mike Lewis in the Sein and Langford Mustang. Mike is General Manager for Don Schumacher Racing, and in addition to being a former grad of FHDRS, has spent time behind the wheel of a few cars (including the A Fuel car of Tom Conway). It was Mike’s first night, however, in this Nostalgia Funny Car. I’d rather win than lose at anything I do, so I decided I was finished with driving tips for Mike (although I’ve watched him race and he really doesn’t need any). First round…light ‘em up! Right at the end of my BIG 400’ Chi Town burnout, the air line that supplies the pressure to the transmission to put it in (and keep it in) high gear blows off the trans! This is a problem. Without air pressure, I’ll only have low gear and will have to shut down at half track or risk over-revving the engine and damaging Troy’s car. I downshift to stop the air leakage, select reverse and back up. As I near the start line, I’m pointing frantically at the loose air line and Troy sees it. He reaches in the side window and pushes the line back into the fitting. Mike Lewis is pulling to the line and I don’t want to hold him any longer, so I pull cautiously forward. I have a few things to think about in my last several seconds before launch. How much air have we lost? There are 2 popular bottle sizes that I’ll call big and small. I don’t know which one Troy’s car has. If we don’t have any air, the car won’t shift to high and I’ll have to shut down. If we have a small amount of air, the trans will try to shift but not have enough pressure to do so and will just burn the clutch pack in the Lenco trans. If it does shift solidly, we’ll have enough to go the distance, but I start thinking about why the line came loose in the first place. If it comes loose while in high gear near the finish line, the trans will go into low gear and cause an instant over-rev and possibly big damage. 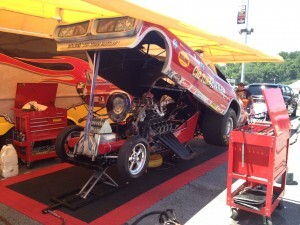 So with a typical drag racer’s mindset, I stage with Mike and away we go! The run feels great. We are out in front by a wide margin as Mike’s car had some early problems. The shift point is coming. I press the shifter button and…nothing. It does not shift and I lift off the throttle instantly. A brief moment later Mike goes roaring by for the win. After a short review with the crew in the shut down area, we’re back to the pits. Between rounds it’s more autographs, a bottom end check and a look at the transmission. Good news…no trans damage. I discover that Troy has the smaller of the two sizes of air bottle, and we agree that by the time I staged there was probably almost no air left. In the second round we are paired with the Raymond Beadle’s Blue Max. The Chi Town Hustler and the Blue Max have probably raced one another a hundred times or more over the years. In fact, I raced the Beadle while driving the Hustler many times in the 1980’s. Tonight, however, veteran Ronnie Young is at the wheel. Another BIG burnout for the Chi Town and I back up to face the Max. This time we have a new air line and a full air bottle. I floor the throttle. I’m coming up on the shift point, press the shifter button, it shifts and I keep on going. The finish line is coming and I don’t see the Blue Max. We win! I shove the chute levers forward as I close the throttle and grab the brakes. No chutes. This can be a problem. I reach over and get the fuel shut off while still pulling the brake lever as hard as I can. The car makes a few big hops at the end as the safety crew is motioning me to take the additional run off space. I stop safely about 200’ from the end. A quick inspection of the equipment revealed the problem and it was fixed for next time. Our eight mile time showed we were on track for running in the 5’s, but the engine lost a little steam in the back half and we ended up with a 6.09 ET, which was about third quick for the last session. I think it was a pretty good performance overall. Chad Head, son of NHRA Nitro funny car racer Jim Head, was the overall winner and had produced a low ET performance of 5.88 in the first round. Mike Lewis came back strong in the second session with a 5.93. What a great night. Thanks to Troy and his team for giving me a chance to drive again. Thanks to Lex for inviting me and putting on a great show and thanks to the fans for coming out. I’d love to do it again. Now it’s time for me to get back to teaching people how to race in Gainesville, Norwalk, Houston, Denver, Indy, Vegas and….Maple Grove! If you want to contact me about racing, driving or anything else – go to www.frankhawley.com, call 866-480-7223 or Tweet me @Frankhawleydrs.